Over 50 young East Africans came together in the EAC headquarter to discuss Young People’s Participation in the Political Process during the 1st High Level Youth Ambassadors Dialogue, 5th-6th November 2018. The DSG Mr. Charles Njoronge openend the dialogue acknowledging youth as the key resource for economic growth. The High Commissioner of Kenya to Tanzania Amb. Dan Kazungu encouraged the Youth Ambassadors from all partner states to focus on unity and to help the region prosper through innovative ideas. Africa’s future will certainly be determined by the fate of its youth. Nearly 420 million young people are a tremendous asset that can be tapped by giving young people access to education and meaningful participation in political processes. The East African Community wants regional integration to be people-centered. And as East Africa’s youth will form 75% of the population by 2030, it is vital to engage and enable the young people of today to lead East Africa tomorrow, as Dr. Kirsten Focken, GIZ-EAC Programme Manager put it in her welcoming remarks. The EAC Youth Ambassadors are a linkage between the EAC Secretariat, regional networks and the student clubs across the partner states. 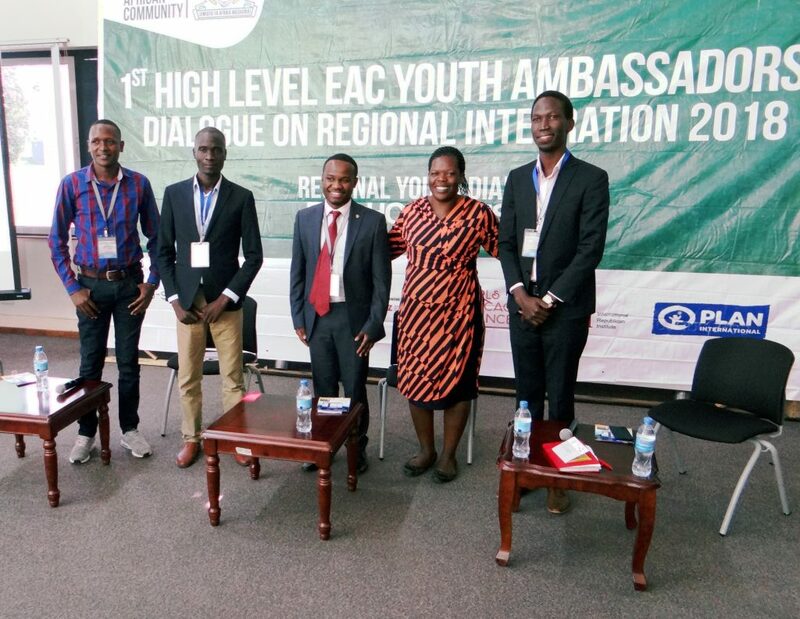 The EAC Youth Ambassador’s Platform (EAC-YAP) was launched in 2013 during the 2nd University Students’ debate, supported by the GIZ-EAC Programme. Up until now the Platform has grown, consisting of 150 active members today. It fosters participation in political processes through knowledge and experience sharing. The Youth Ambassadors are looking forward to revive the platform and the spirit of the East African Young People under the slogan #WEMOVEIT. During the Panel Session "My Story Inspires" our IIDEA partners Chrispinus Onyacha (creativeDNA) and Gowind Ocen (CEFORD) shared their experience. Also Joseph Muya, the founder of Tuwakuze and Otim Brian (EAC Mobile App) explored innovative ideas. Senior Advisor for IIDEA, GIZ-EAC, Joyce Abalo Kimaro introduced IIDEA to the Youth Ambassadors. Since 2012 over 70,000 young people have been sensitized on regional integration and the East African Community through the Youth Clubs, the EAC Mobile App and EAUDC initiatives of the Youth Ambassadors. One vital tool is social media to reach young people and spread the word. The Youth Ambassadors illustrate their engagement and viral usage through the live screen tweets under the #EACYouthDialogue. A new form of reporting and live streaming. 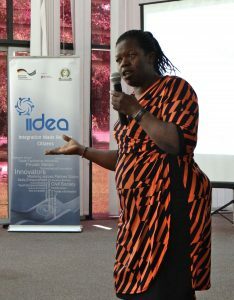 Engaging Youth in the regional integration process through the Incubator for Integration and Development (IIDEA): Senior Advisor Joyce inspires young people to follow their ideas. This dialogue event created a great opportunity to identify the opportunities for meaningful youth participation and assess young people’s participation in the political processes in East Africa. In providing a collaborative, open and inclusive space for young people to critically and objectively reflect on enhancing meaningful youth participation and come up with tangible recommendations. This means also engaging closely with all stakeholders, and tapping into the opportunities of regional integration presented by IIDEA, the Incubator for Integration and Development in East Africa. Senior Advisor Joyce Kevin Kimaro Abalo could excite the entire crowd to test out their ideas and be part of the implementation of the common market protocol as incubatées. Our IIDEA partners clinicPesa and prokaziea shared their inspiring stories, developing innovative ideas with the help of seed funding to internationally recognized projects. It is time to push for youth policies and to translate those policies into praxis. It is so good. My comment is that we consider sometimes young people in terms of age or poverty in Africa. People are young because of their mind are producing new ideas and so are enthousiastic to become more dynamic ie they are respecting their ideas and are turning or reviewing them in to innovative concrete concept for daily solving problem.